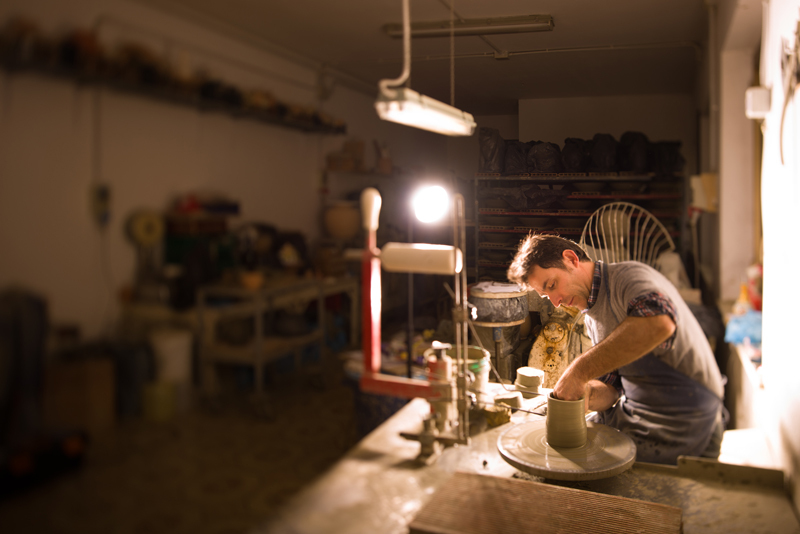 Travel to the small town of Deruta nestled in Umbria, the green heart of Italy and you’ll find no shortage of ceramic producers that have been based here for a number of years. Pottery is a well-known and very respected artisan craft around these parts because of its previous abundance of a certain kind of clay. It is here you will also find the notable technique of majolica, along with areas in Tuscany. People come from all over to purchase goods from businesses here, and its proximity to Perugia (a 15-minute drive) makes it a convenient day trip. However, at the same time, we have seen the rise of cheaply-made ceramics. Often with frightening uses of lead that despite the “Made in Italy” claim, are used to lure unsuspecting tourists. 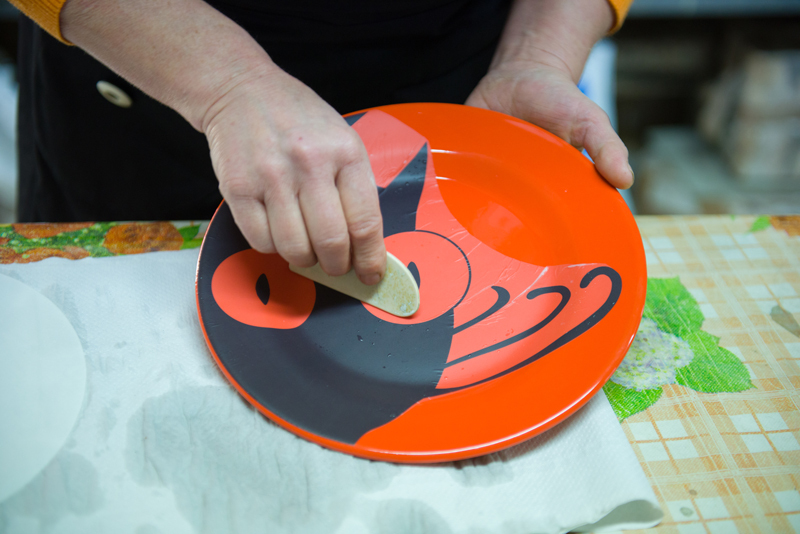 We want to support the best and this brings us to today’s feature on Gatto Matto Design, a laboratory of art and graphic design selling unique ceramic gifts inspired by the imagination of young creatives based in Lazio. 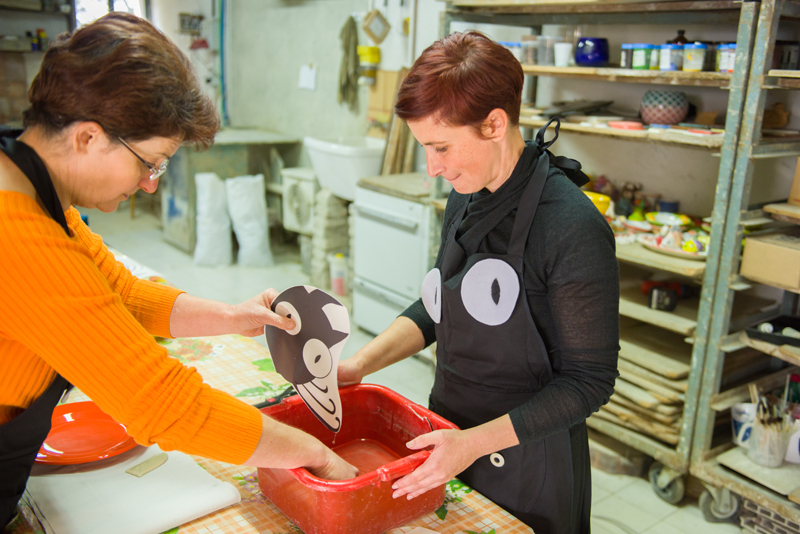 After studying the art of making ceramics from Deruta, they have partnered with likeminded Italian crafts businesses there to sell colorful ceramics that are made entirely by hand. To break away from tradition, they don’t stick to traditional painted techniques and instead use modern technology to add their own unique design touch to quality ceramic. I’d like to think of it as a very 2016 approach to the continuation of these traditions in rural Italy. We now feature a line of their Gatto Matto’s pretty items in our shop, think cups, and teapots with colorful cat motifs. This gives you guys, our readers, a chance to help support local designers and artisans while also picking up something that will hopefully last a lifetime. I got the chance to talk to them myself to see what makes their products special and sustainable. Who is Gatto Matto Design? Can you tell us the story of your business? Gatto Matto Design is a self-made design studio. What is self-made design? It 'a very specific area of ​​the design that is realized through the collaboration between designers and artisans. 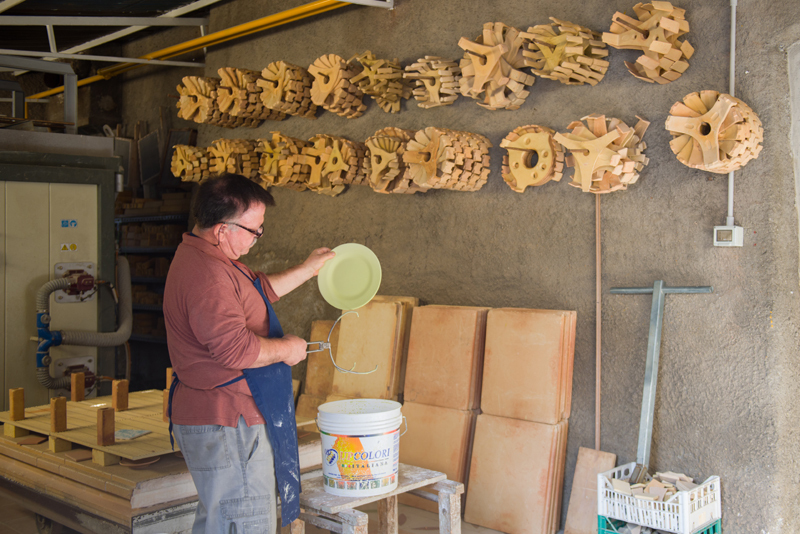 In our case, in practice we design ceramic objects, after designing them, we make models and molds with a 3D printer, and then we develop a prototype and finally the finished product is trusted to local Deruta craftsmen. These artisans have joined our project and share our values. What are our values? The self-production, namely the synergistic collaboration between designers and craftsmen, specifically the meeting between different experiences and languages, which allows for the exchange of knowledge and skills and the use of different tools and technologies. Made entirely in Italy, our items can be summed up in product quality, which on one hand is closely related to the choice of raw materials that are sourced locally, 100% toxic free, while on another end is the guarantee of the highly technical and professional level of the craftsmen. Their expertise lies at the heart of the creative process. We also believe in sustainability, which for us means not only making products “green” (use of renewable energy, the environment and human health, short chain), but also making our objects ethically sustainable. Our production is based on close collaboration between small Italian businesses, that by working together they also support each other, which represents the Made in Italy brand and lifestyle. 2) Why did you choose to do this work? Was this a family business or part of the region’s local culture? In truth, neither. Our father is a craftsman but works in an entirely different context, in the realm of electrical repair. To be honest the ceramic tradition in our area (Ciociaria) was almost completely lost. That's the reason that drove us originally to ceramics. We care a lot about this type of art and are willing to take the time on realizing this dream, we also have a real desire to preserve and transmit an ancient memory. This will hopefully add the ceramic tradition into the cultural fabric of our local territory. 3) Is there any particular workmanship or material that makes your products recognizable to everyone? I would say everything: the shapes, glazes, manufacturing, and our graphics and logo of course. 4) Let’s talk specifics. How do you design a job and where do you start? It starts from an idea that somehow floats in our mind, which we then sketch onto paper. Then we begin our search: what materials to use (land, glazes etc. ), which tools are needed, and work on the technical and design aspect. The next stage is the execution phase, which is very long, there are a number of processes to do, both mental and manual. 5) How many hours of work are behind a Gatto Matto creation? Aside from the design phase, the duration of which has an unpredictable variation in hours, days and even months. To achieve a ceramic Gatto Matto three firings in the oven are necessary, which means 24 hours in ascent (cooking) and 24 hours of cooling, for each bake. To this we must add the time necessary to perform the other steps, namely the modeling on the lathe, which is often performed in a few minutes due to the technical skill of our artisans, the drying phase then follows. This phase has a lot more variables due to the seasons and weather because it occurs in open environments. After that we proceed to the first firing. 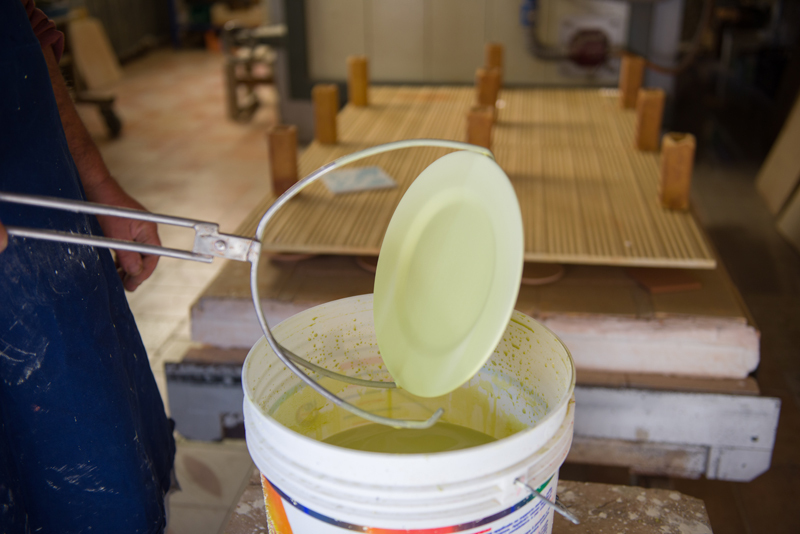 Once the item is ready and controlled, it is then passed to the waterproofing phase with opaque enamels, which are prepared for the glazes. Which by the way is strictly non-toxic and previously decanted, the item is glazed by dipping, and then is touched up with an airbrush and brush. At this point the object is baked a second time. Before we move on to the decoration, the object is checked and when it needs it, we make further refinements to the enamel. 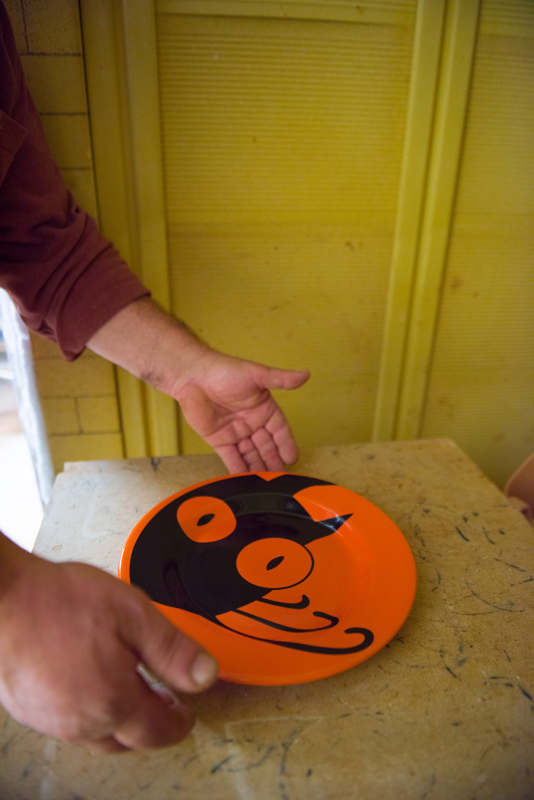 For decorating the ceramics, we use the technique of the decal. We design our decorations digitally, which are then printed on a special transparent film absolutely toxic free. We then cut them and paste them on the ceramic object with water. That may seem like the simplest operation of the whole process, but in reality it is not so, because it requires a lot of precision and dexterity. At this point the object goes through the firing process a third time and, barring unforeseen circumstances, is finally ready! In summary, to achieve a ceramic Gatto Matto design, it usually takes around 30 days. 6) In this historical moment what are the difficulties you encounter in your work? 7) How do people react to your work? Do they appreciate the craft? Generally, people are always curious and delighted when put in front of our products. The Gatto Matto products are highly appreciated both for design and graphics, both for quality craftsmanship. Also for the high level of manufacturing, which then has the greatest impact on the durability of the item. 8) There are ideas for future projects or for the development of its activity? Yes, we have many ideas and plans for the future of our business, but we prefer not to reveal them in advance. I know you can understand why. We prefer to continue working on it and to develop our research before concretely presenting our new projects. Thanks guys! If you want to explore Gatto Matto’s ceramics in our shop have a look here, also have a look at our other made-in-Italy line of e-commerce gifts, just in time for this holiday season!